For my final project of HIST 483- Asian Migrations to the Americas, I worked with 2 classmates, Jamie and Victoria, to develop a new framework to understand the effects of cultural appropriation of Asian cultures in particular. In order to shed light on the complexity of the topic, we chose the model of a "spectrum" to engage readers to think beyond "is this cultural appropriation?" to "if this is cultural appropriation, how are people affected and who benefits or loses?" 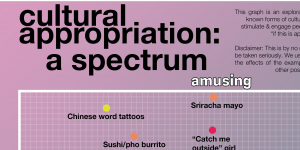 With this goal in mind, we created a fun graph to organize examples of cultural appropriation along 4 identified dimensions, and a simple blog which delves into the deeper history of some of the examples. The project is presented on a website created on Wix. Cultural appropriation is generally defined as the use of material, such as property, images or imagery, artefacts, ideas, of a culture that is not your own. For the purpose of our topic, we decided to narrow this definition as: the adoption of elements of a minority culture by members of the dominant culture which produces power imbalances. While this course has delved into topics ranging from the Komagata Maru incident to portrayals of East Asian sexuality and gender in North American films, the one major takeaway has been that history always exists in the present. Furthermore, the topic of cultural appropriation of Asian cultures is one example of how historical racial discrimination makes its way into modern media (ex. yellowface in cinema). We chose to develop a visual graph that "maps" commonly discussed examples of cultural appropriation from our daily lives and popular media as the centrepiece of this project. 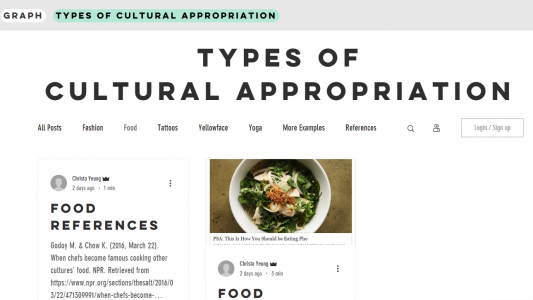 The main purpose of doing this was to reimagine how we discuss cultural appropriation and show that it is multi-dimensional, complex, and nuanced. I worked with my team member Victoria, to design the graph on Canva and Adobe Illustrator, and we used a gradient from lighter pink/purple to darker turquoise to illustrate how some forms of cultural appropriation can be more harmful than others: superficial and amusing examples have "lighter" effects, and exploitative and offensive examples have "darker" effects. More of the methodology of the project can be found here. I particularly enjoyed working on this graph as it combines 2 passions of mine! Visual communication, which I usually explore through cartography and GIS. Applying theory to daily experiences and sharing this with audiences outside of academia. I am truly privileged to have the opportunity to pursue post-secondary studies- learning theory has enriched my life, but these findings need to reach people outside of academia! I researched and wrote concise blog posts on the topics of tattoos and food appropriation using online news articles and academic literature. As the blog was directed to our peers, I found that the most helpful way to quickly explain these broad types of cultural appropriation was through sections of relevant history, "who benefits and loses?" and "the verdict"- which summarized the topic and where it fit on the graph. Condensing complex social issues onto a concrete graph. As graphs are usually used to represent quantitative information, this can trick readers into thinking that the examples presented are derived through a scientific or calculated process. This is why we chose to list examples in a humorous/satirical tone and wrote a disclaimer in the blurb at the top of the page. Selecting a narrow set of examples. We wanted to select famous figures and commonly discussed examples not to point fingers, but to help readers create easy to grasp connections and address questions that we've also always wondered about (ex. What about Justin Trudeau's Haida tattoo?). In retrospect, there are many more relevant examples (ex. henna) that we wanted to include, and this may be an idea for future expansion of the project! As our project was about making a new framework of thinking about cultural appropriation, I addressed this in one way by making a printable blank version that readers can use to organize additional examples they see in their lives. In the future, however, we suggest developing the graph into an interactive page where readers can become co-creators and map their own examples or move around old ones. 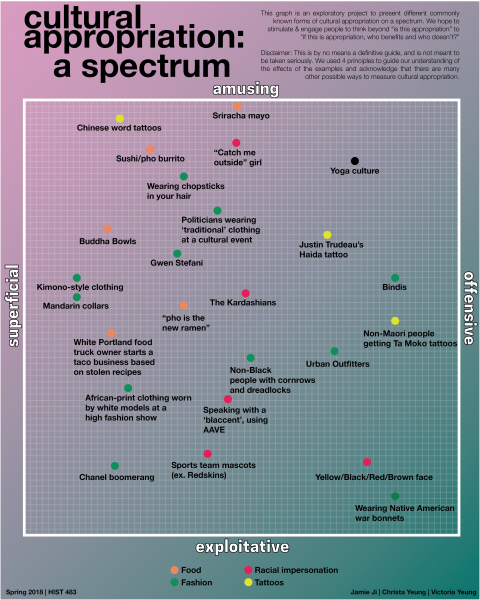 Kind of like a cultural appropriation atlas! Coordinated a detailed schedule of tasks with three group members to complete a final project within strict deadlines.